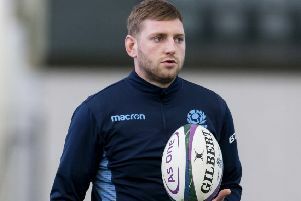 Head coach Vern Cotter and his Scotland management team will weigh their options before deciding on a replacement for Finn Russell on next month’s tour to Japan. The 23-year-old stand-off was ruled out of the trip to the Far East yesterday following the shocking head injury he picked up in the first minute of the 16-11 Guinness Pro12 semi-final defeat by Connacht in Galway. The sickening clash with 20-year-old team-mate Zander Fagerson, who also had to depart the field of play, resulted in Russell receiving oxygen before being transferred to hospital, first in Galway and then down to Dublin. Thankfully, the news yesterday was that he is expected to return home later in the week and doesn’t require surgery. However, as expected, he will no longer be on the plane to Japan, where Scotland play back-to-back Tests on 18 and 25 June, though there was no immediate confirmation of a replacement. Ruaridh Jackson, who joins Harlequins from Wasps in the summer, was the other stand-off named in the original compact squad of 27. The most obvious replacement for Russell would be his former Glasgow deputy Duncan Weir, who is now an Edinburgh player. The fact that Weir was not announced yesterday suggests that Cotter is willing to wait and consider his options and, perhaps, wants to give the player a chance to bed himself in at his new club and get a full pre-season under his belt. Peter Horne, who was named in the squad as a centre, can also operate at stand-off and has been capped there for Scotland. If he was now considered a No 10 along with Jackson, that would leave a gap in the midfield group which could yet be filled by Mark Bennett. He is in the extended Great Britain Sevens squad for the Rio Olympics and the final cut to 12 is not due to be made until July. Other options open to Cotter are to draft in 24-year-old former Edinburgh stand-off Tom Heathcote, who has been impressing for Worcester, or promote Adam Hastings from the Under-20 squad to gain senior experience, although that would deprive coach John Dalziel of the Bath prospect for the forthcoming Junior World Cup in Manchester. and Harlequins wing Tim Visser, both of whom picked up knee injuries with their clubs and have been replaced by Matt Scott and Sean Lamont. It is an undoubted blow to lose Russell, who has developed into a key player for Scotland, considering the way Cotter wants his team to play. The hope now is that Russell makes a speedy recovery from a freak injury which, mercifully, appears not to be as bad as it potentially could have been. The Scotland squad will convene for a training camp at BT Murrayfield on Monday 6 June before flying out to Japan on Saturday 11 June.